I saw this cake recipe in one of the Sunday Supplements a few weeks ago. Unfortunately I can’t remember which one or who’s recipe it is coz I took a snap of the recipe on my phone and cooked from that. It looked rather delicious though so, when I fancied a bit of baking, I thought I’d give it a go. It’s an interesting recipe, quite different to ones I’ve tried before. It does get a bit messy, using various bowls, jugs and cups so there’s more washing up involved than I would like but I think the results are well worth it. This cake has a really nice texture. It’s moist as a result of the marmalade drizzle but never gets soggy. It has an almost chewy bite to it, in fact, and it’s nice and dense without being heavy. The chunks of orange peel and the chocolate chips add some nice interesting bits inside. It was a big hit with everyone at the office and gets two very enthusiastic thumbs up from me! – Heat the oven to gas mark 4/180C and grease/line a 900g loaf tin. (Which I have learned is not the very big one, or the little one, it’s the medium sized biggish one). – In a large bowl mix the flour, ground almonds, baking powder, bicarbonate of soda and salt. – In a large jug mix together the eggs, golden syrup, yogurt and vanilla extract. – Put the cocoa and the coffee in a mug and add about 100ml boiling water. – Put the marmalade in another mug and add about 5tbsp boiling water. (You can also use orange juice, I didn’t have any so water it was!) If your marmalade has long strands of zest then use scissors to chop them up to more managable lengths. 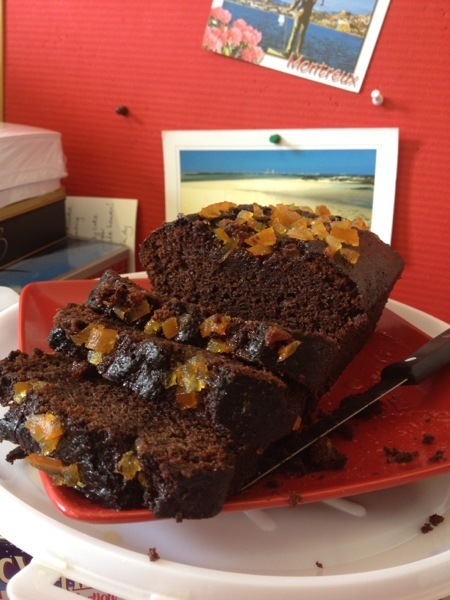 – Add the egg mixture, the cocoa and half of the marmalade mixture to the dry ingredients. Retain half the marmalade for glazing the cake later. – Stir everythign together until it’s smooth with no lumps of flour. – It’s cooked when a skewer inserted into the centre of the cake comes out clean. – Allow to cool inthe tin for 20 minutes then turn out onto a wire rack to cool completely. – Place on the plate you want to serve it on and stab all over with a skewer, making sure you don’t go all the way to the bottom of the cake. 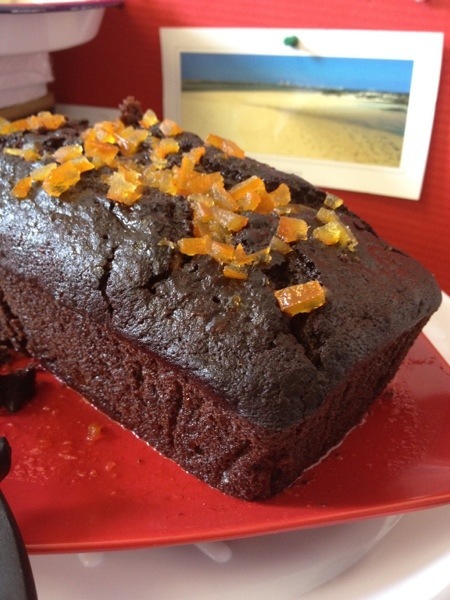 – Gently spoon the remaining marmalade glaze evenly over the cake. It may puddle a bit but you can scoop it up and reapply it if there’s tonnes. – Leave to stand for at least 1 hour before serving so it can soak up more of that glaze. It’s really yummy! Hope you enjoy it!